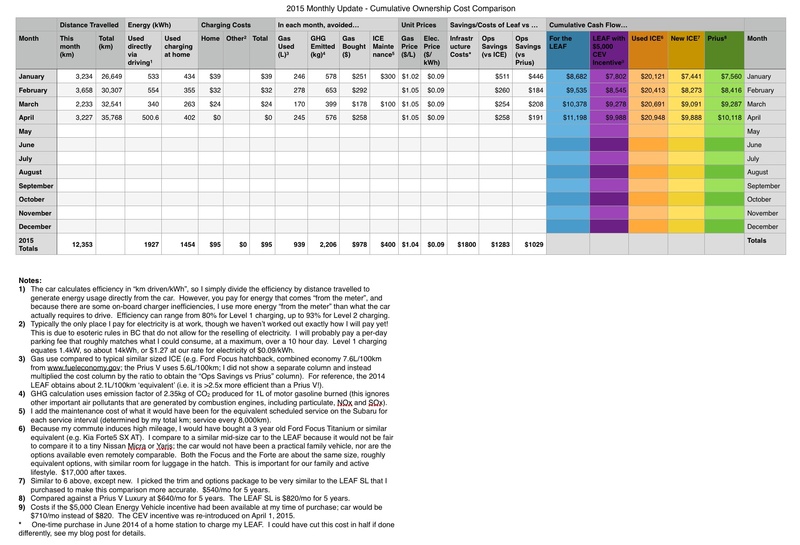 The big news item in the intervening 3 months was the return of the Clean Energy Vehicle incentive, which for a Leaf is $5,000 off of the purchase price. I have added a Leaf with this incentive added to illustrate what the incentive would have done, in my case anyways. 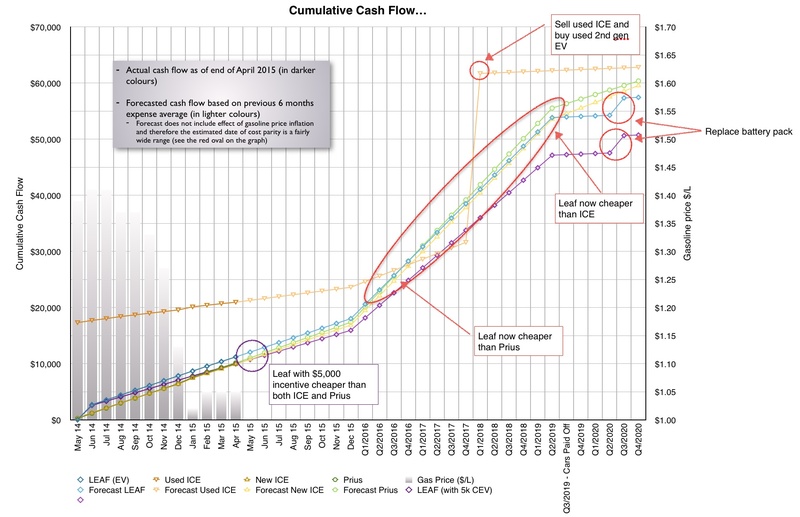 I would have been pretty darn happy if this incentive had been available when I purchased my Leaf, because as you can see in the chart below, you will note that I would reach cost parity with BOTH the internal combustion engine (ICE) vehicle and the Prius about this time! An interesting tidbit from this time period, a report came out that analyzed battery degradation against daily driving habits and found that EVs will work for a substantial portion of the US population even with 20% degradation after several years. I might replace my battery a few years earlier than the average (as shown in my chart in 2020) because of the long commute I have. And from the rumour mill, the Leaf may get a mid-cycle refresh with a battery with more range! I would find this quite useful to help bridge the typical distances between towns on the Crowsnest Highway and Highway 97 (since towns/cities are more likely to have available EVSEs), so if it were available to retrofit into a Leaf, I would likely replace my battery even earlier to take advantage of this improvement in technology. Lastly, not really EV related, but useful for anyone putting bikes on their small to mid-sized car. 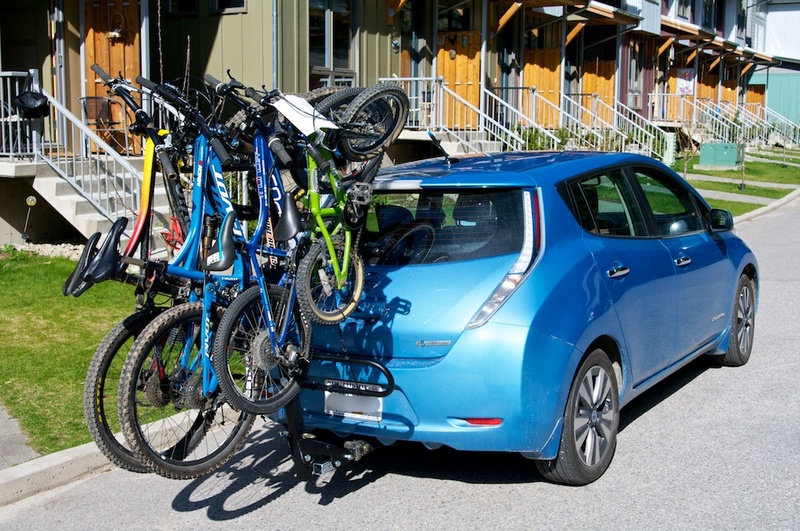 I had been using a Yakima “Stick-Up” 4 bike rack, but it was almost 100 lbs, which meant that I was slightly over the listed 200 lbs weight limit for the tongue weight on my hitch for the Leaf. I purchased a NSR-4 rack from Northshore Racks in Vancouver – this rack is slightly over 50 lbs, so now my total load is comfortably under 200 lbs. As a bonus, the rack is easier to work around when it is empty on the car, I can leave it up all the time and still access the hatch.